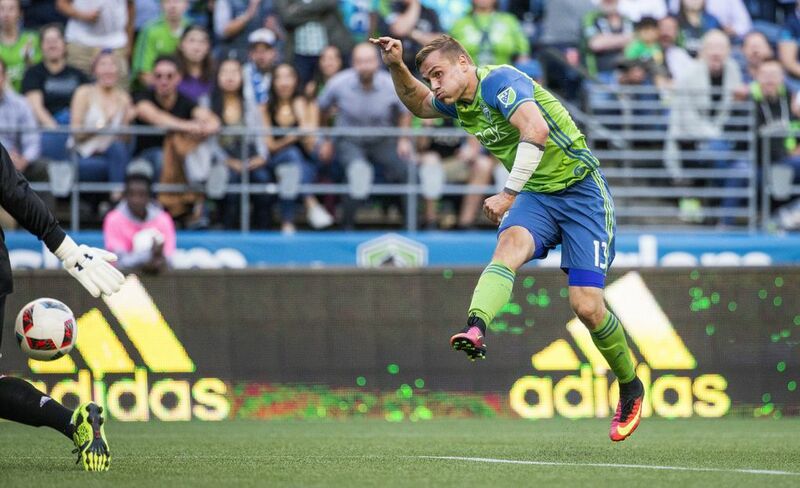 Clint Dempsey, Andreas Ivanschitz, Jordan Morris, Joevin Jones and Cristian Roldan all scored as Seattle routed short-handed FC Dallas 5-0. 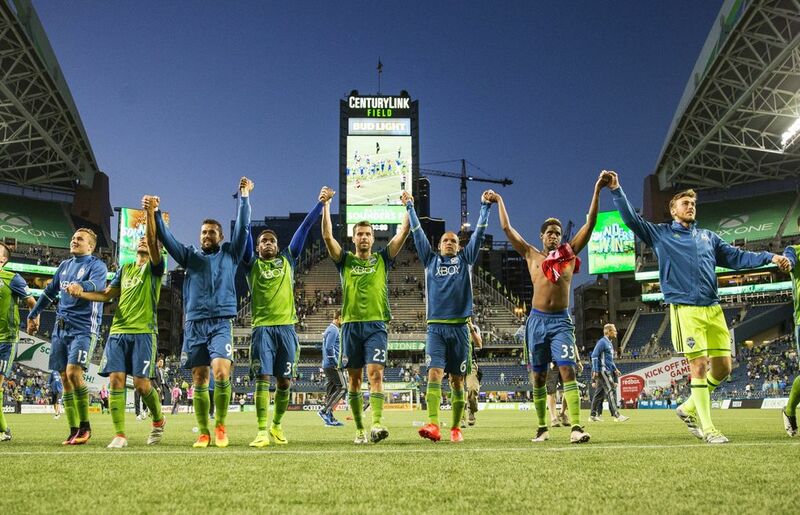 This wouldn’t be the 2016 Sounders if even their most feel-good victory of the season didn’t come with a few caveats. 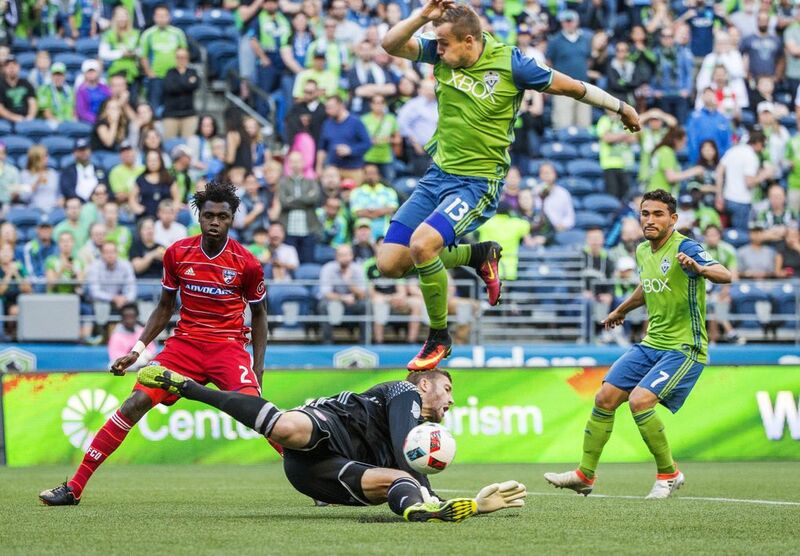 Clint Dempsey, Andreas Ivanschitz, Jordan Morris, Joevin Jones and Cristian Roldan all scored as Seattle routed short-handed FC Dallas 5-0 Wednesday night at CenturyLink Field. They hadn’t scored three times in a match all season, but managed the feat in less than 23 minutes Wednesday. 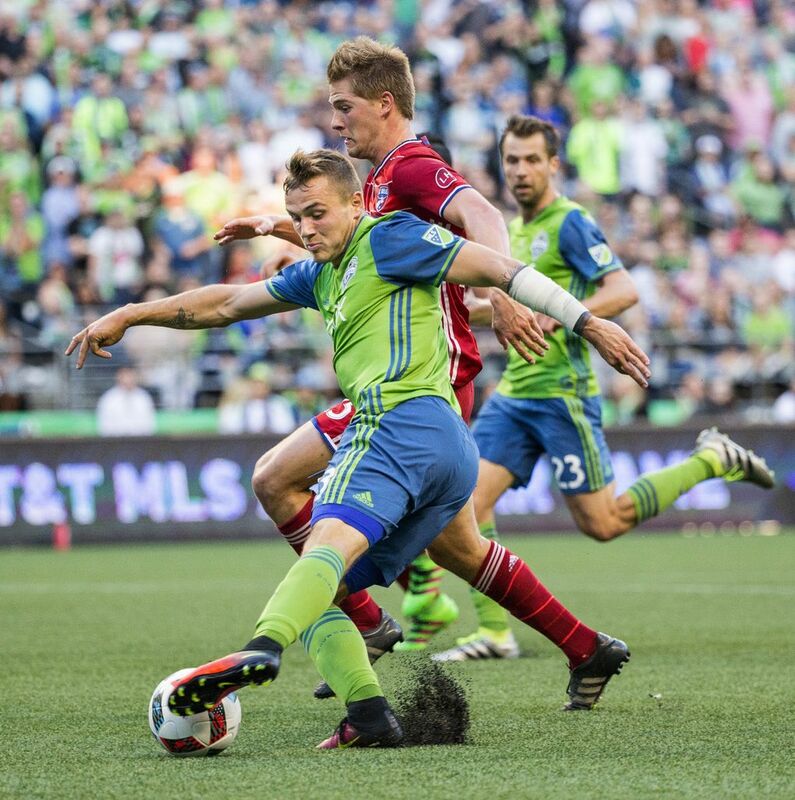 Roldan had yet to score an MLS goal in his young career, but the second-year midfielder rose high to head the cherry into the top corner. 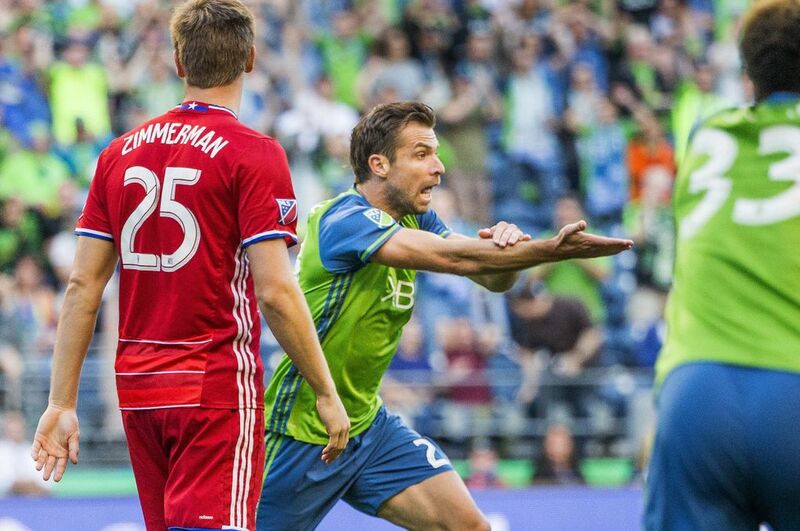 Seattle (6-10-2) broke a home scoring drought in league play that dated to May 7 and climbed out of the Western Conference cellar. 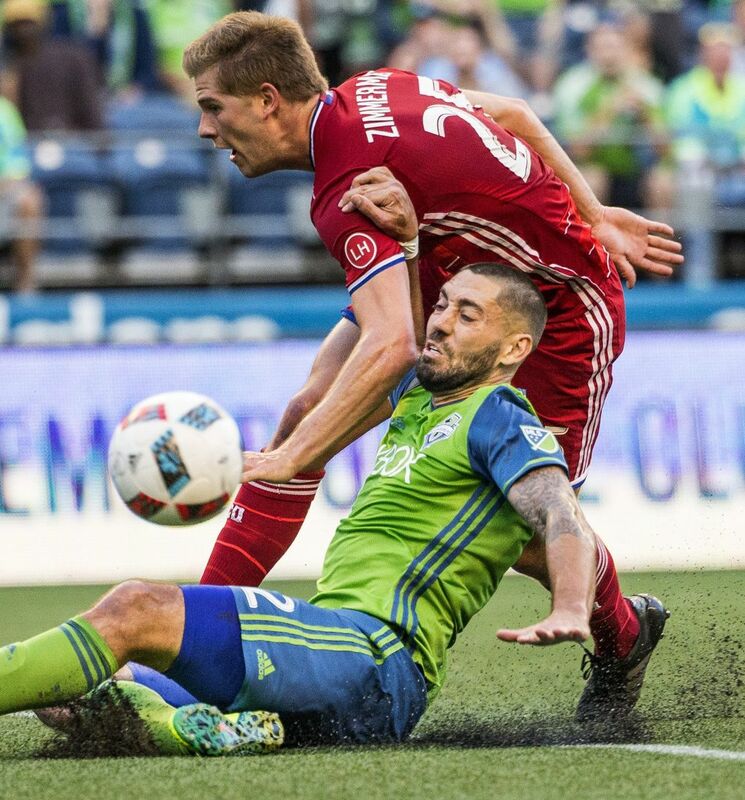 The Sounders also lost Dempsey to a red card in the 33rd minute — and he’ll miss the nationally televised rivalry road match Sunday against the Timbers thanks to the resulting suspension. 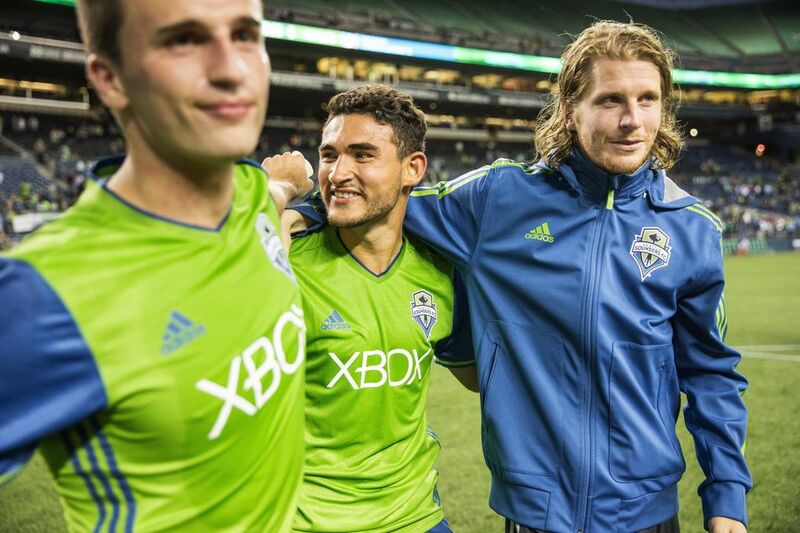 Dempsey had been getting into it with Juan Esteban Ortiz all evening, the Dallas midfielder growing increasingly physical as Seattle’s lead quickly grew from one to two to three. Ortiz caught Dempsey with an elbow to the throat just seconds before the flashpoint, and he made the most of the incident when Dempsey caught him in the face with an open hand — immediately falling to the turf with an anguished cry. 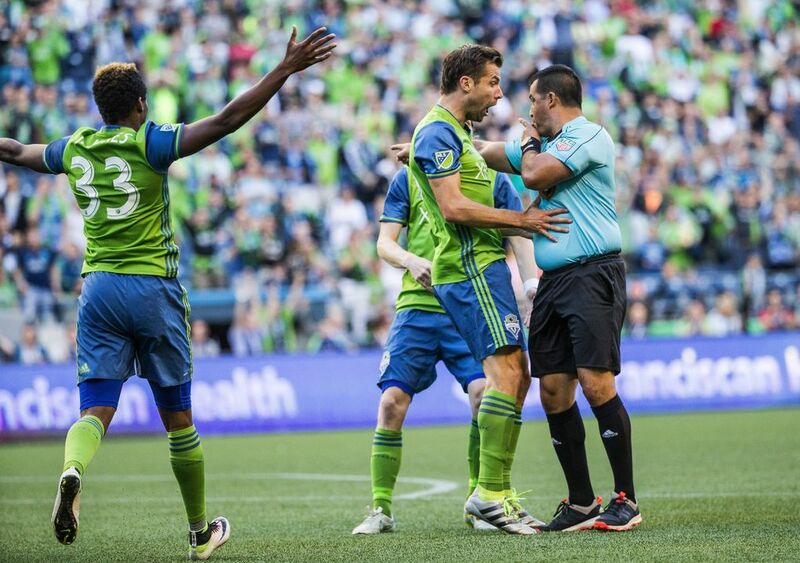 The red card referee Ricardo Salazar lifted over Dempsey might have been a bit harsh, but it was certainly justifiable. 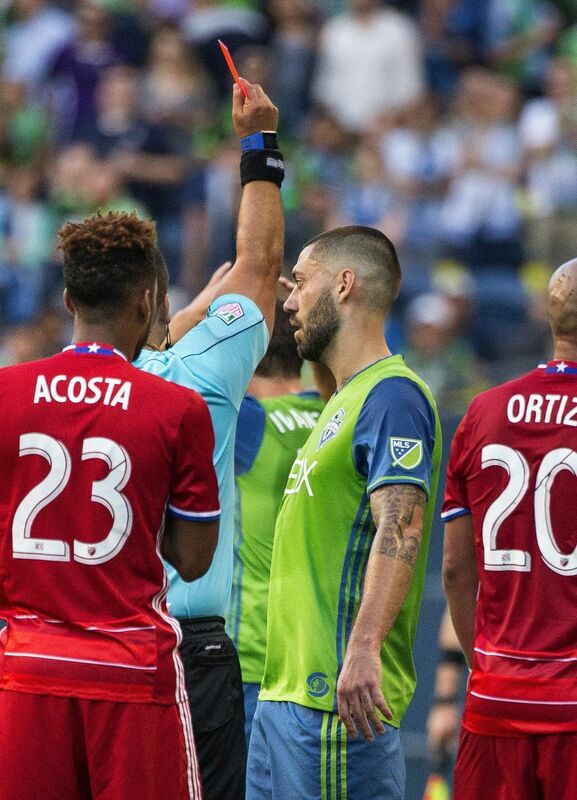 A veteran like Dempsey should have definitely known better then to lash out against an opponent who was clearly baiting him for a reaction — Ortiz was yellow-carded for persistent fouling, having been called for his fourth infraction during their tussle. 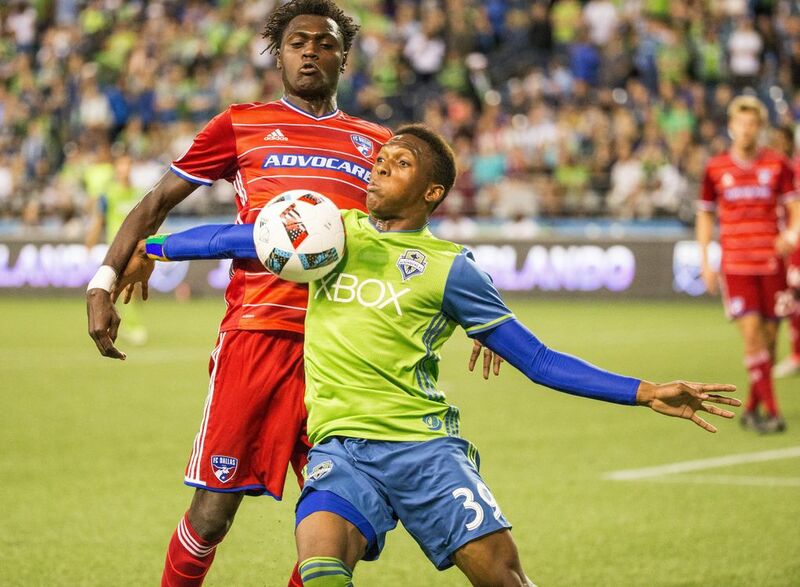 Facing a midweek game in the midst of a busy run of games, Dallas coach Oscar Pareja opted to give a number of regulars the night off. 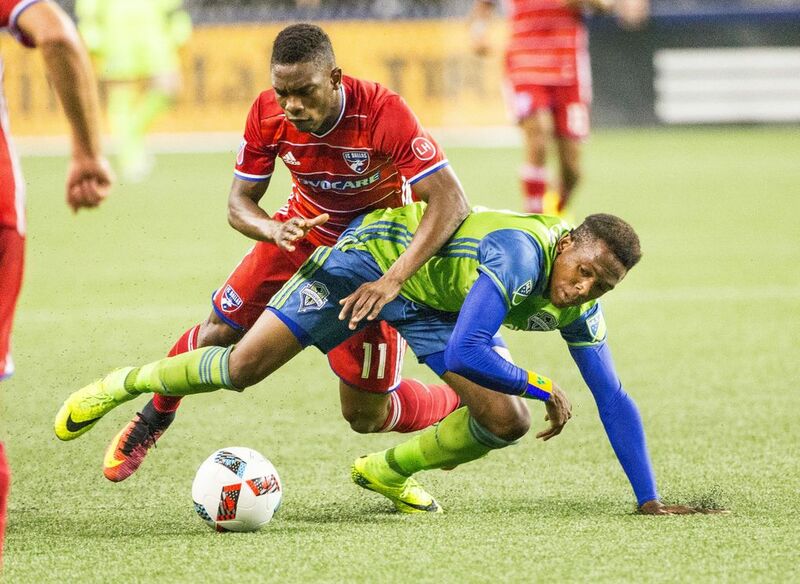 Fabian Castillo and Maximiliano Urruti, vital parts of the attack tied for the Western Conference lead in goals, were on the bench. 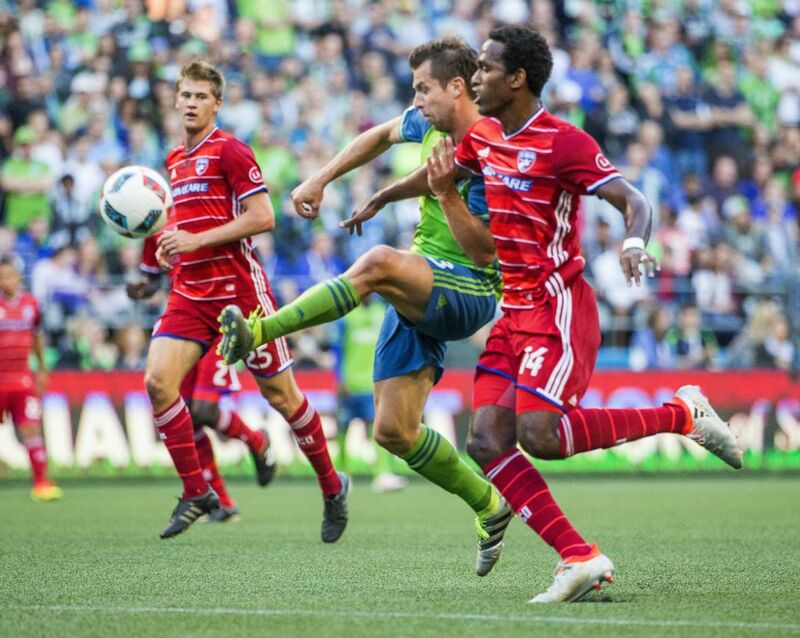 Playmaker Mauro Diaz, who currently ranks second in MLS with nine assists, was given the night off entirely. “I had a couple of words for my team on that and they reacted appropriately,” Schmid said of the visitors’ lineup choices. 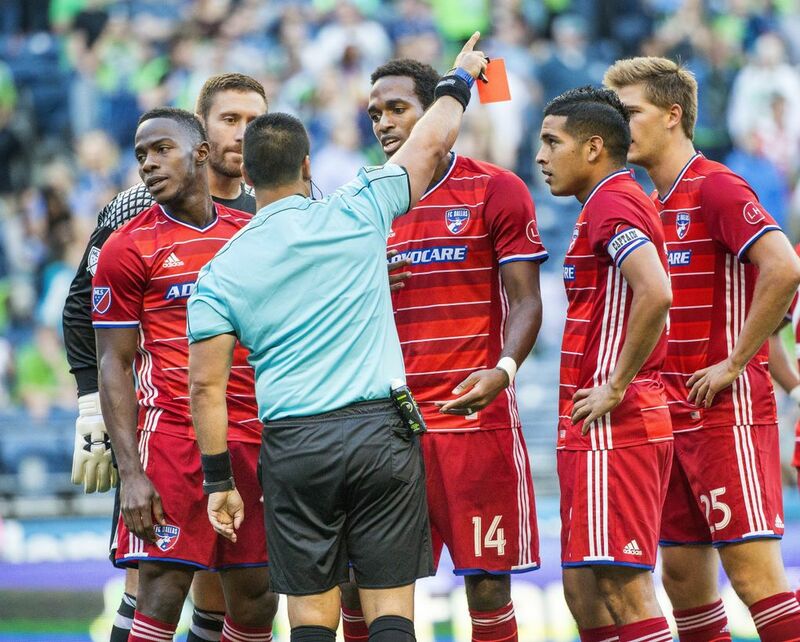 The prospects of FCD’s ‘B’ team went from bad to worse when Maynor Figueroa gave away a penalty kick and was red-carded for a sixth-minute handball. 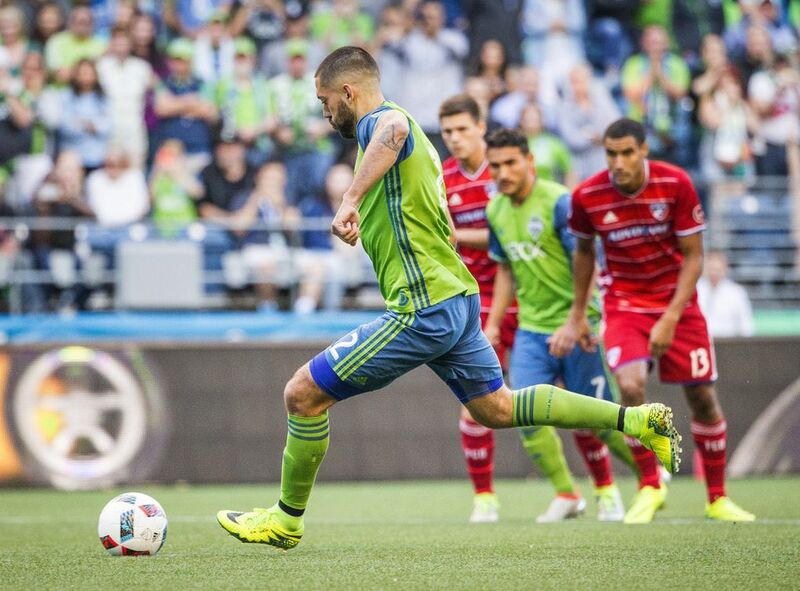 Dempsey buried the spot kick, and goals from Ivanschitz and Morris quickly followed. 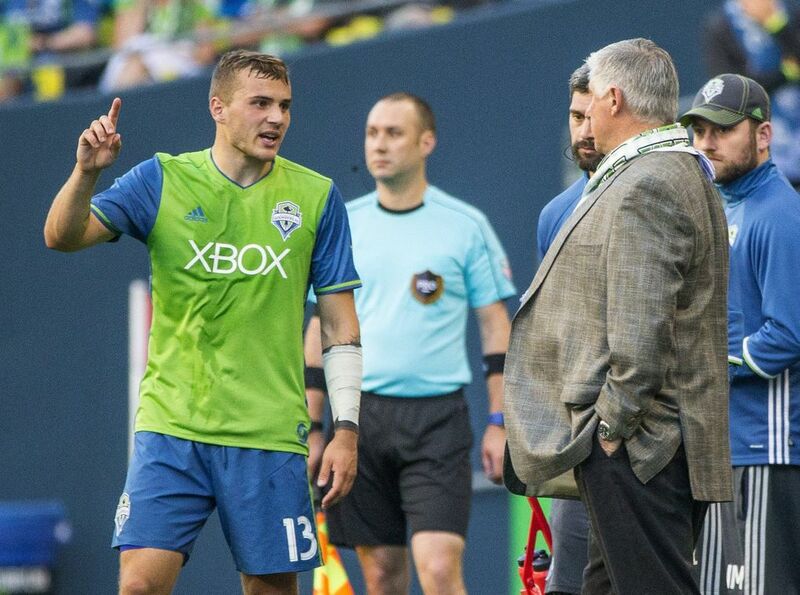 Even if it’d have been hard to read too much into such a result against a weakened opponent, at three goals and a man up, Seattle was well on its way to an overdue night of lighthearted fun. Their veteran leader sucked a bit of the air out of what otherwise would have been a resoundingly positive result, and will miss one of the year’s biggest matches. 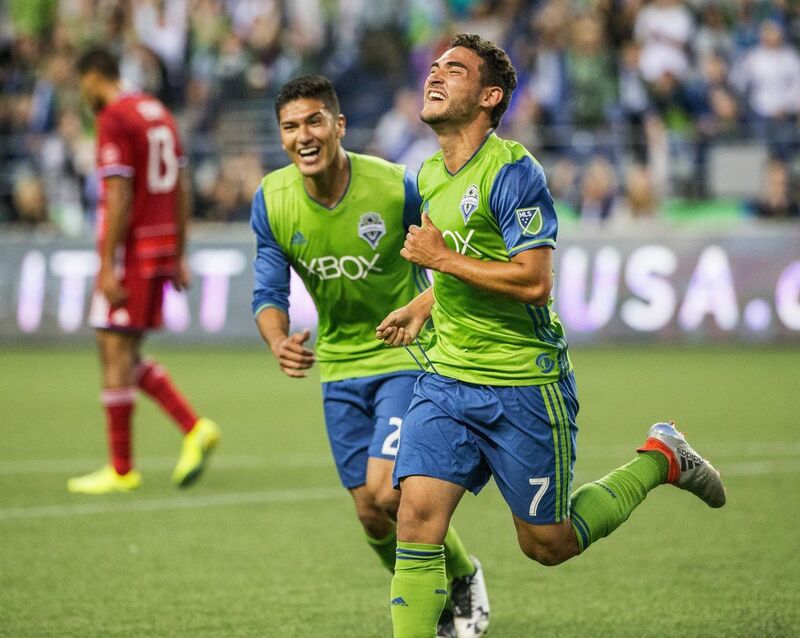 Yet Seattle’s youngsters still badly needed and will be boosted by this victory. 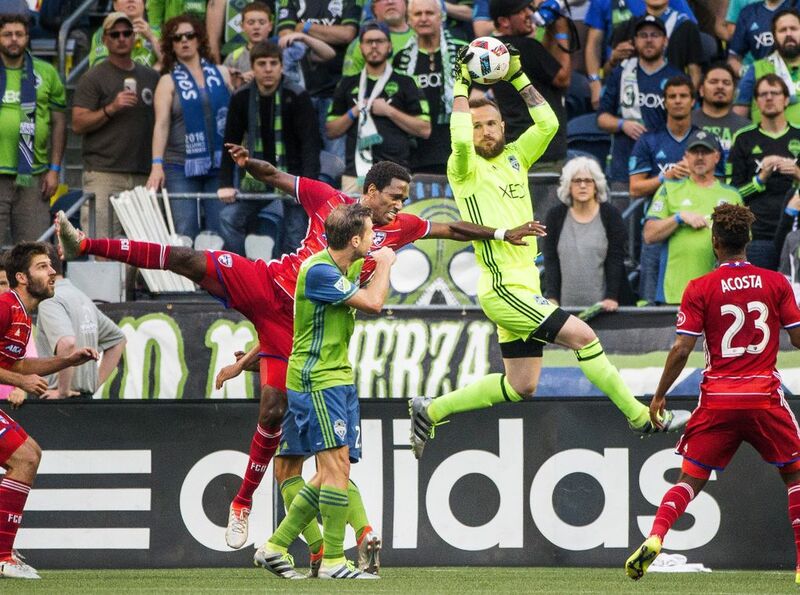 The Sounders have gotten few good bounces this year, let alone one as fortuitous as the glance off a defender that redirected Jones’ 61st-minute goal past Dallas keeper Chris Seitz. 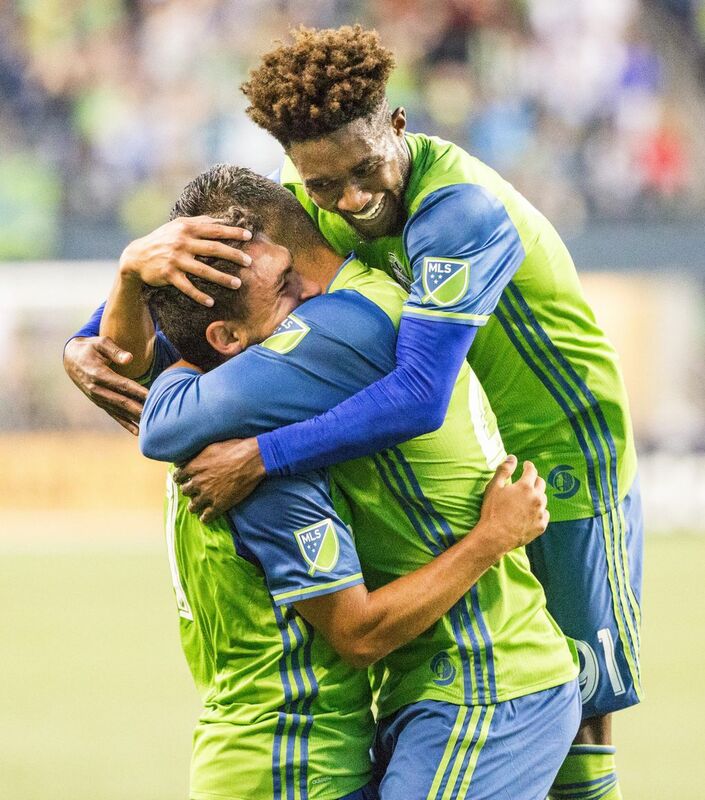 Roldan’s first-career MLS goal had been a longtime coming, and he finally got on the board with a header off a free kick 12 minutes later. 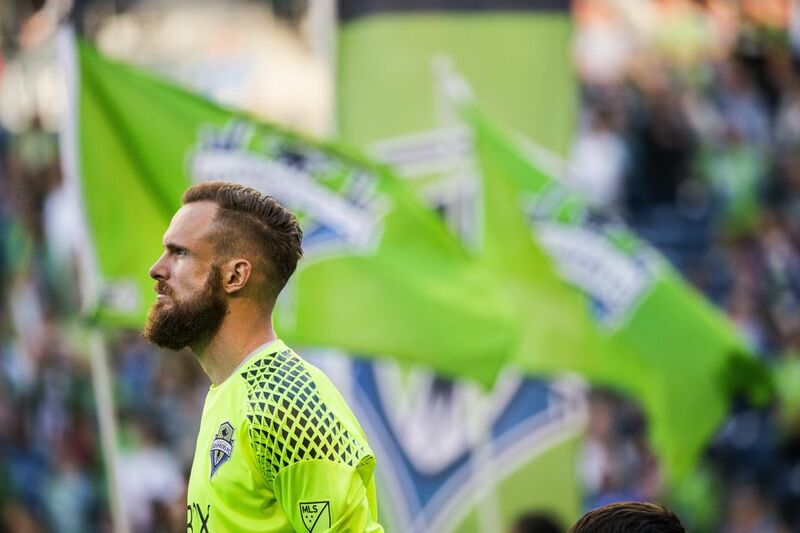 Plenty of players will make the drive down Interstate 5 this weekend with boosted confidence — Dempsey just won’t be among them.